Decongestants and antihistamine commonly used to treat a variety of disorders associated with the upper respiratory system (nose, mouth and throat). A common problem that affects the nose, mouth and throat such as colds and various types of allergies. These conditions cause discomfort such as sore throat, stuffy nose, sneezing, coughing, itchy and watery eyes, etc.. These symptoms are triggered mainly by the swelling of blood vessels in the nasal cavity or due to histamine release. Decongestants and antihistamines are two types of different drugs have different effects. 1. Histamine is released when antibodies tend to make small blood vessels in the eyes, nose, and skin become dilated. Consequently, there is a variety of symptoms such as skin red and itchy, runny nose, sneezing, and red eyes and runny. To overcome this condition, given antihistamine to inhibit histamine release. To be effective, an antihistamine should be taken when allergy symptoms begin to appear. 2. Some first-generation antihistamines are commonly used diphenhydramine and chlorpheniramine. Currently, there is also a second-generation antihistamines such as loratadine, fexofenadine, and cetriizine which has better quality. 3. The side effects of antihistamines include dizziness and drowsiness. Therefore, jobs that require mental alertness such as driving or operating heavy machinery should be avoided after taking antihistamines. The best time is taking antihistamines before bed at night. 4. 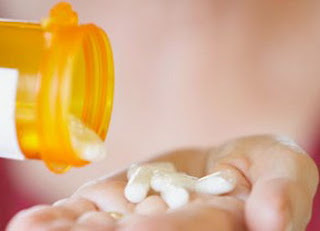 Someone who has taken drugs such as antidepressants or sedatives should avoid antihistamines. This is due to the combined effects of these drugs can have adverse effects on health. 1. The blood vessels were present in the membrane of the nasal cavity will dilate when in contact with a virus or allergens. Dilated blood vessels will also be accompanied by fluid and mucus production. Excess mucus that will meet the airway causing breathing difficulties. In this condition, a decongestant to help reduce swelling and narrowing of the blood vessels return wide. Thus, airways to be open and free from mucus blockage. 2. Previously, popularly used as a decongestant phenylpropanolamine but then discontinued use due to adverse health effects. Currently some of the commonly used decongestants include pseudoephedrine and phenylephrine. 3. Decongestants act as a stimulant and increases the pulse rate that makes someone difficult to sleep. That's because, decongestants should be consumed during the day and avoid it before bed.